With our record breaking snowfall over the last few weeks, Massachusetts is officially the snowiest place in America right now. 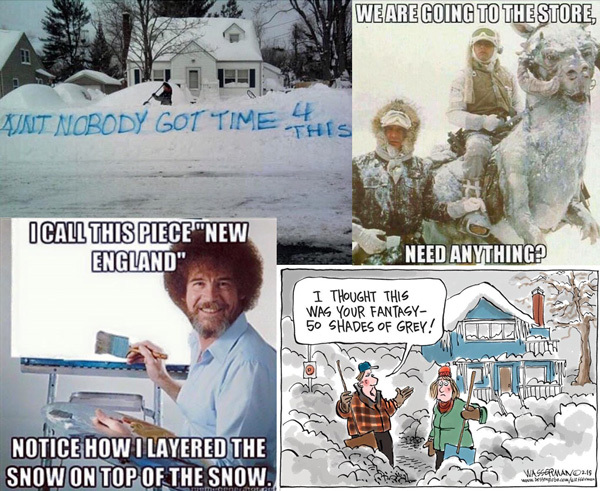 In fact, it’s become nothing short of comical (see some of my favorite memes above). In Jimmy Fallon’s monologue last night, he described a Boston resident’s reaction to yesterday’s light storm in Washington D.C. as “Four inches of snow? I left for work this morning out of a second-story window! Cowboy up!” It’s true that for most, all this snow is nothing but a huge nuisance, but for me it’s been a chance to revel in wintery fashion more than ever. I think I’ve hit a personal record for consecutive days wearing some sort of fur or fair isle to work – so in keeping with this theme, I’ve compiled some favorite winter-related items of interest. Another design element that Mischa Lampert plays with is scale, as she freshens classic styles with exaggerated dimensions. 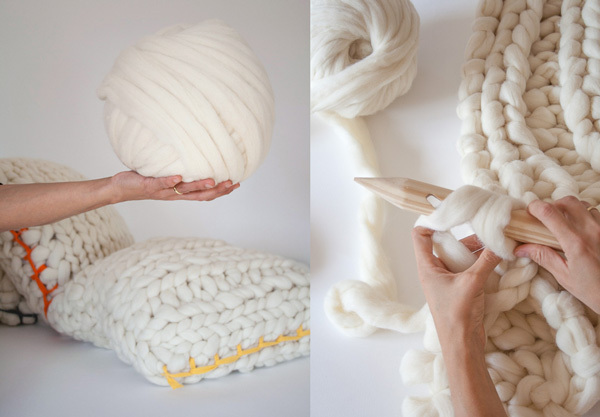 Thinking along the same lines, the Spanish company Knitting Noodles offers merino wool products for the home and has taken this idea of “chunky knits” even further. I love that you can either select one of their finished handcrafted items or opt for a ball of super-sized yarn and some extra large needles to create a luscious wintery creation of your own! It seems that when working in these over-sized proportions any inconsistency in the knit just looks all the more charming so there’s no reason not to give it a try! On a completely different planet of cool knitwear comes this Maison Martin Margiela Fall ’14 runway piece that I will forever covet. I am enamored with the modern clash between the brand’s signature pagoda shoulders juxtaposed with a classic nordic graphic pattern. 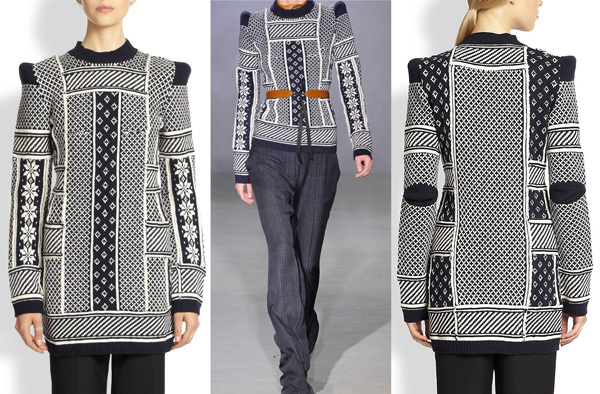 The rest of the collection represents a feminine take on an exceptionally tailored British male wardrobe, but it seems to be of unanimous opinion that this fair isle sweater was a standout of the show. Maybe someday it will stand out in my closet! 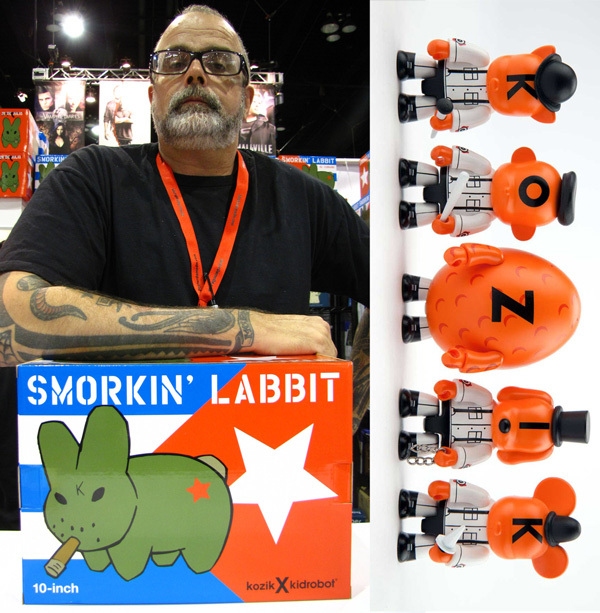 Last year the artist Frank Kozik came to Converse to give a lecture on his life and work. He told us of his fascinating career designing concert posters, running his own record label, and transitioning into the collectible toy movement (including the inception of his famous Labbit – see box art above). I found Kozik to be unassumingly brilliant with a matter-of-fact attitude that you can get a sense for from this advice he has for young artists: “You have to forget about the concept of you’re working or you’re not working. Like, you are always working, but it’s cool because you’re not working – if that makes any sense.” Amidst all of the irreverent iconoclastic art this man seems to effortlessly create, a tidbit that stuck with me during his presentation was that he is also an avid collector of Richard Scarry original artwork – some of the most wholesome imagery one could imagine. What does this have to do with winter, you ask? 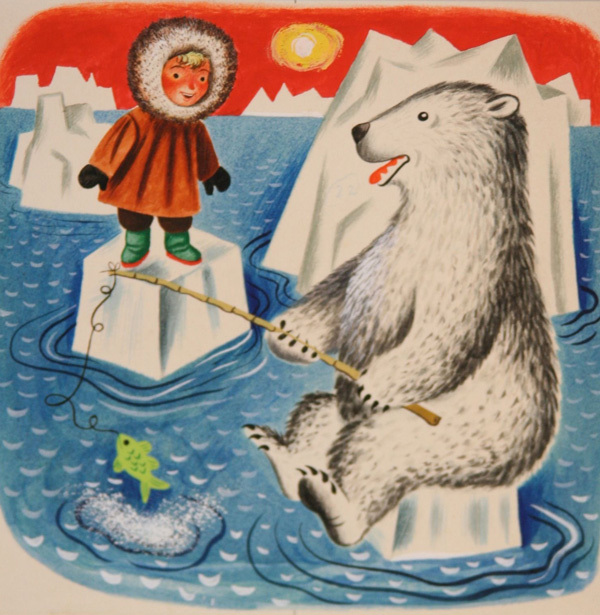 As a Richard Scarry fan myself, ever since Kozik gave me the idea of owning an original Scarry illustration, I’ve been monitoring the market on eBay and this arctic scene from “Albert’s Zoo” has been one of the few pieces to turn up (now sold for $625). 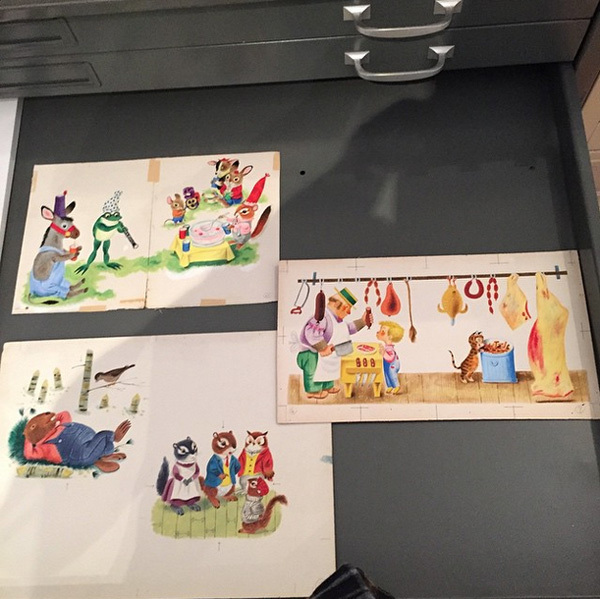 Whether Kozik, like me, admires Scarry’s art for his technique, the whimsical characters, or a representation of the sweet simple life that children get to enjoy, its nice to know these treasures are in good hands. Last but not least, I almost fell off my chair when I saw the grand finale of the Moncler Grenoble Fall 15 collection this week – a bride and groom in full bridal snow gear. I could not help but immediately make the connection to my own wedding and honeymoon where Adam and I dressed in a similar white and black ski ensemble. Moncler themed their show around Valentine’s Day, showcasing 25 couples – dressed to the nines in the ultimate of luxurious outerwear – each ready for a different sport. Everyone kissed at the end of the show in what’s being called “the greatest group makeup session in fashion week history.” Sounds to me like the perfect way to heat up this record breaking winter!